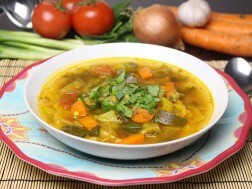 Could a classic vegetable soup get any more nutritious? It sure can by loading it up with anti-inflammatory and vitamin-packed ingredients. Golden from the turmeric spice used, and surprisingly hearty from the plethora of high-fibre veggies, this bowl of nourishing comfort is exactly what the doctor ordered to boost immunity and our body’s natural detoxification process. Versatile and easy to make, we invite you to play around and swap in other veggies for new flavour nuances each time you make this soup. Try parsnips, Swiss chard or squash. Enjoy as a side dish or starter to your dinner, or as a light lunch alongside some protein, or a soothing and filling way to tie you over in between meals. In a large pot, heat the oil over medium heat and sauté the onions, garlic, carrots and celery until tender – about 5 minutes. Add in the cabbage, zucchini, tomatoes, turmeric and oregano and cook another minute. Pour in the stock or water and bring to a boil. Let it cook for 20 minutes with the pot lid almost closed (leave a small opening to vent out steam). Add in the kale and spinach and let cook another 10-15 minutes. Taste and adjust seasoning if required. Serve with an optional garnish of green onions and fresh basil. Leftovers can be refrigerated and consumed within 3-4 days, or frozen in batches.